No trip to Morocco would be complete without a visit to the Sahara Desert. 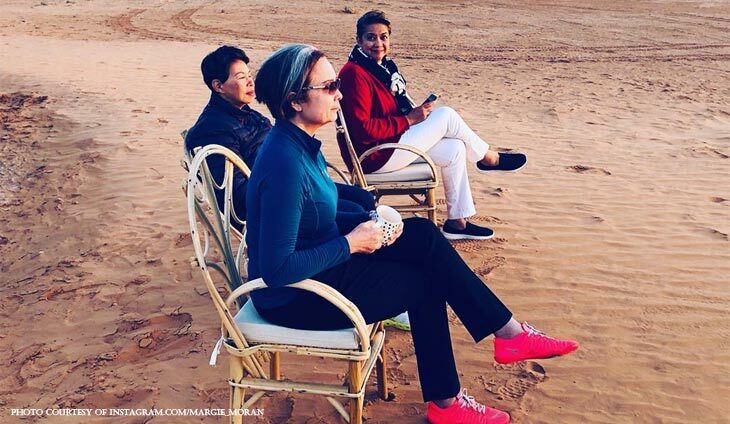 Miss Universe 1973 Margie Moran-Floirendo shared her unique glamping experience. Glamping in Sahara means spending a night in the desert in a private tent in style and comfort. “Glamping in the Sahara. The must things to do in the desert is to bask at the desert sun at sunset and sunrise and gaze at the stars and planets because the sky is devoid of clouds. I tracked 3 planets at 4am and waited for day break at 5.30am. We had hot coffee and quickly meditated as the sun rose turning the sky from dark blue to light with hues of pink and yellow. We feasted on our last tagine meal-eggs tagine. We had a good and peaceful rest in our luxury tent organized by Jemal of Mint Tea Tours. #moroccoholiday,” said @margie_moran. That was definitely one for the books, ma’am Margie! It's no secret that Singapore is a melting pot of different cultures and cuisines. This top official personally looked at the rehabilitation efforts there. Unlike the dead, there can still be a second life for these accounts.